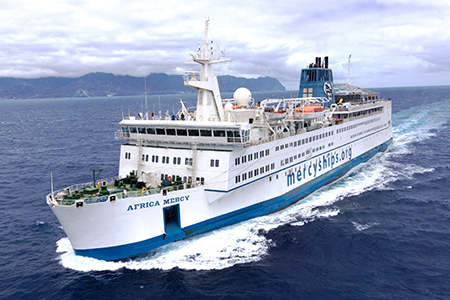 SPOKANE, Wash. – The Africa Mercy recently sailed from the port city of Douala, Cameroon, after a 10-month stay. The medical crew on board the world’s largest civilian hospital ship had performed more than 2,700 surgeries during that time and trained more than 1,400 people to provide health care. The faith-based nonprofit Mercy Ships relies on volunteers for nearly everything – nurses and doctors for medical and dental care, captains, deckhands, teachers and trainers. In Cameroon, one of those volunteers was Mica Kondryszyn, who graduated from the Washington State University College of Nursing with a BSN degree in 2013. Kondryszyn spent five months on board the Africa Mercy, working in pre- and post-surgery. A wide range of procedures were performed there, she said, including orthopedic corrections, plastic reconstructive surgeries for burns and birth defects, maxillofacial surgeries such as for cleft lip and palate, women’s health and ophthalmic care. Dental treatments, palliative care, and even agriculture training is offered by the ship’s volunteers during its stay. There is no charge for the care provided, a model that Mercy Ships has followed for 40 years. Mercy Ships has between 1,200 and 1,400 volunteers per year, all of whom pay their own way to and from the ship and work for free. Heather Peterson, director of staffing for the nonprofit, said the only paid positions on the ship are a crew of eight security guards. Mica Kondryszyn with a patient on Mercy Ships. Photo by Jamie Barki, Mercy Ships. Patients might have lived for years with the condition that brought them to Mercy Ships, but she said she was struck by the optimism and joy she saw in people who had suffered greatly. “People are very driven and courageous and just do what they need to do to survive,” she said. Sleeping six volunteers to a room and working rotating night and day shifts were the hardest parts of the experience, she said. 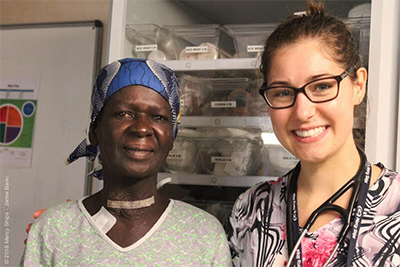 Kondryszyn had worked for three years on the cardiac medical floor at Providence Sacred Heart Hospital before leaving for Cameroon, and she has returned to that job.